I've had the privilege of working with Customs and Border Protection on a number of occasions. The men and women of CBP do an incredible job of protecting the American dream against incredible odds. We've all seen the freeway chase scenes on the evening news. 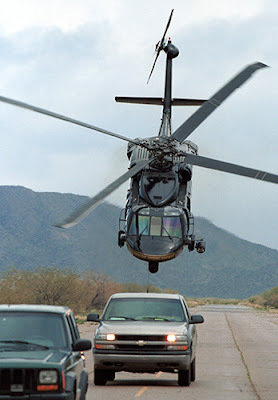 Today's photo brings a slight twist on that theme - chasing down the bad guys on the border ... with a Blackhawk. The picture just needed a little work to help the Blackhawk jump off of the page. I started with fixing the focus with a touch of Smart Sharpen. I moved on to address the colour cast (slight blue) with a Curves adjustment layer. 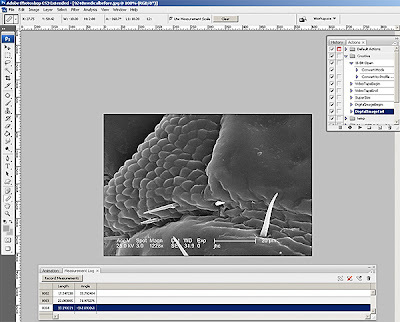 You can use a temporary Threshold adjustment layer to find the black and white points quickly. The image was still a bit soft, so I added some edge sharpening with EasySharp. Next, I moved on an got rid of most of the noise with Noise Ninja. I needed to size the image down for faster downloads, so I reduced the image size choosing Bicubic Sharper to resample the image. Finally, the image needed a sharpening tune up after sizing the image down, so I used Smart Sharpen again. This time, I duplicated the layer and sharpened the duplicate. Then I dialed the opacity down until I achieved the desired result (about 30%). The final result really shows off the Blackhawk in its pursuit. I can't imagine what was going through the bad guy's mind as he looked in his rear-view mirror. I received a sweet surprise today. My HP laptop arrived. I say surprise because yesterday my "service manager" called to assure me that he (in Texas) was personally overseeing my repair (in California). He tried to reassure me that I would definitely have my laptop back by the 4th of January. This morning, my laptop came with the day's Fedex. As much as I appreciate the early delivery (sarcasm intended), HPs communication problems will continue to cause them to lose customers (like me). The repair sheet lists a new hard drive and a new heat sink/fan assembly. Small problem ... the laptop left with an 80GB hard drive and arrived back drive slightly smaller. ... 63 minutes later, I've spoken with 3 people in India and Nick in Oregon. Nick has sent a replacement HD that should arrive next week. Nick tried very hard to restore my faith in HP. I wish that HP had more tech staff like Nick so that my calls wouldn't get routed overseas and my problems would get solved in 3 days (as opposed to 3 weeks). Exploring career options ... where do you start? 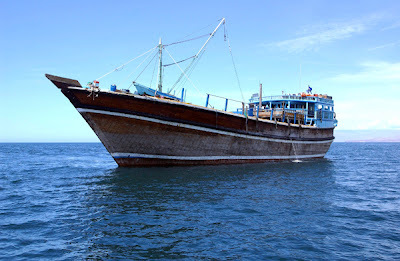 Today's image was taken in the Gulf of Aden on April 30, 2005. - Sailors assigned to the guided missile cruiser USS Normandy (DDG 60), and the coastal patrol ships USS Typhoon (PC 5), and USS Firebolt (PC 10), prepare to board a dhow (pictured above). All three ships are currently deployed in the Gulf of Aden conducting maritime security operations (MSO). MSOs pressurize the maritime environment and are the single most significant component of the conventional maritime effort against terrorism. This photo was taken by Photographer's Mate 1st Class Robert R. McRill. Looking to start a career? Love photography? Don't quite know how to get going? Try the US Navy. Yes, the US Navy has a career path for aspiring photographers. Today's photo was taken by a US Navy Photgrapher's Mate. Not really into the Navy? Try the US Army and become an Imagery Analyst. Are you an action junkie? Try the US Air Force and become a Combat Photographer. Looking to stay local? Apply for a Police Photographer position. As the nation (and the world) rushes to put cameras on every street corner, there will be plenty of available jobs for folks interested in imaging. Now, back to today's image. There was a distinct blue cast to the image. This is typical of images taken at sea. I've removed it with a simple Curves adjustment layer and added a touch of sharpening. I've also cropped out much of the foreground water, which can be done in Bridge or in Photoshop, which allows us to focus in on the subject matter. Getting accurate colour can be critical, especially in security operations. Thankfully, with Photoshop and our systematic process ... we can! I recently received a "heads up" from George Reis of Imaging Forensics that I got a mention on John Nack's blog, filed under Scientific and Technical Imaging. Thanks John. I hope that you enjoyed your visit. I've been a NAPP member for years. I've handed out applications during the training sessions that I've hosted. 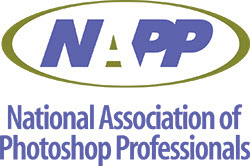 Yet I am still amazed that there are some folks out there who have not heard of the National Association of Photoshop Professionals (NAPP). NAPP is many things to many people. I love getting the magazine each month. I also use the web site to access member's only discounts on tons of tools and equipment. They have an absolutely huge education area. Got a question, send them a note in their Member Services area. Lightroom users can find a wealth of tips, tricks, and training help as well. From time savings to discounts, you'll more than make up for the cost of your annual membership. I'm planning getting my next two purchases, an Apple workstation and Alien Skin's Exposure 2, from the NAPP member discount center. Make joining NAPP one of your New Year's resolutions. Tell them that you heard about them from Jim Hoerricks on the Forensic Photoshop blog. Happy Boxing Day. Here are some helpful links to add to your forensic imaging bookmarks. "Delta-E: Delta-E (also written as ΔE) is a unit of color difference. One ΔE is equal to the smallest change in color the human eye can detect." "Posterization -- How smooth is the histogram: Posterization is a special effect where an image is rendered using only a limited set of colors or gray levels. The smoothness of a histogram can tell you how well the image represents subtle tonal variations. The more the histogram consists of isolated spikes separated by empty spaces, the more the image is posterized." "Five factors determine the cost per print of the printer: (i) purchase price including taxes, (ii) retention period, (iii) rate of return, (iv) throughput and (v) estimated disposal value." "One thing to bare in mind though is the file format that you save your files in. Unless this is a popular mainstream format (like TIFF or Photoshop's .PSD) it is possible that in as little as 10 or 20 years there may not be software around able to read it. Whatever approach you decide to take though, backup early, backup often, and keep a complete archive at another location. One day you'll be glad you did." "New in OS X 10.5 and the Epson driver is the ability to send 16-bit data to the printer by selecting the 16 bit/Channel check box. Note however that 16-bit data has to be sent from the current application even if you are presently editing a 16-bit document. For example, Photoshop CS3 and earlier versions always send the print driver 8-bit data on the fly. However, it nice to know that the Epson driver in OS X 10.5 is ready to support a high-bit print path when such applications are updated to hand off all the current data in a document." 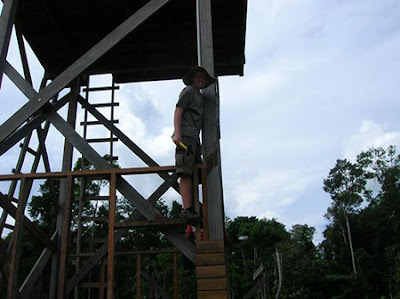 My younger brother recently posted some pics of his missionary work in the jungles of Guyana on his Myspace page. With a touch of the Forensic Photoshop workflow added, his hard work is much easier to see. Sometimes, people spend their whole life looking for "their calling." I am glad that Alec has found his at such a young age. Friends, it's time for us to take a brief Christmas break--at least from following the news. But don't worry! We won't leave you empty-handed while we're reveling. Today, we've got a look back at the real St. Nick--a spry guy with olive skin who lived in what's now Turkey, and whose ample compassion inspired century after century of legend. Then, early next week, KnowledgeNews is coming a-caroling. The legends about St. Nicholas are abundant, but the facts are few. Historians agree that he was born around the year 280 in Asia Minor. During his youth, Nicholas' homeland was under the control of Diocletian, the Roman emperor. Anti-Christian edicts made it a dangerous time for a Christian like Nicholas, and many believers were martyred. Life got easier in 312, when a new emperor, Constantine, called off the persecutions. 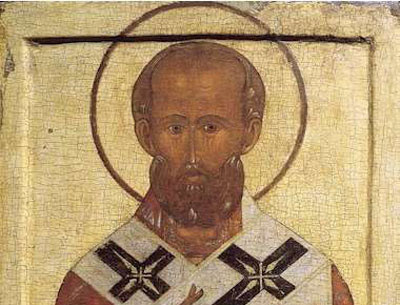 The next year, Nicholas became a bishop. We have no records of his years as a bishop, but it seems he was revered as a kindly fellow who helped the poor and sick. He died on December 6, sometime between 343 and 353, and was buried in the town of Myra. Stories about the beloved bishop spread, and a church was built in his honor in Myra. Some stories spoke of miracles, but the story most told simply highlighted his generosity. According to medieval biographers, Nicholas' parents died and left him an inheritance. Soon after, he heard that a neighbor had three daughters and no money to feed them--much less provide dowries. There was talk they would have to prostitute themselves to survive. When Nicholas learned of their plight, he anonymously left three small bags of gold coins at the family's house. This tale, coupled with Nicholas' celebrated kindness to children, appears to have inspired the tradition of giving gifts on his feast day of December 6. For hundreds of years, the church at Myra attracted pilgrims. Then, in 1087, it attracted some Italians with larcenous intentions. The men smashed into the sarcophagus that contained the saint's bones and spirited them away to the town of Bari, near the heel of boot-shaped Italy. Soon the church at Bari had become a great pilgrimage site. Plays and paintings depicted the saint, and the cult of Nicholas grew. Before long, Nicholas was the patron saint of--take a deep breath--sailors, children, unmarried girls, barrel makers, orphans, prisoners, lawyers, newlyweds, Greeks, Russians, and just about everyone else. He is even the patron saint of pawnbrokers, who still indicate their trade by displaying three golden balls, a reference to the three bags of gold St. Nicholas gave to those unmarried girls 1,700 years ago. When Protestants condemned the practice of praying to saints, St. Nicholas' popularity waned in many Protestant countries. But not in the Netherlands, where the Dutch continued to revere St. Nicholas, pronounced "Sinterklaas." In 1626, a group of Dutch settlers traveled to America in a ship adorned with a St. Nicholas figurehead. It wasn't long before the legend of "Santa Claus" took root in the New World. PS. So much for a white Christmas. Christmas in Los Angeles brings blue skies and a gentle breeze from the mountains. High today ... 67F. We might as well be in Australia. My wife an I received our Christmas present early. On the 20th, we welcomed our son, Alistair Thomas, into our family. At 10lbs 7oz, it took a few storks to lug him upstairs to our humble abode. Merry Christmas everyone. Enjoy the day. Yesterday, I received Resolution Video's Christmas message. One of the things listed on their naughty/nice list (on the naughty side) was printing in Photoshop CS3. Mac users will not see the big deal. PC users noticed the huge change as Adobe moved to standardise the program across platforms and operating systems (a huge undertaking to say the least). John Nack addressed this issue back in June on his blog. Check out the post here. "The change which seems to be causing the most consternation is the change from application-wide page setup to document-specific page setup in Photoshop on Windows. This is the way the Mac version has always behaved, and was the way the Windows version of Photoshop was intended to behave way back in the day, but for one reason or another, that never quite got hooked up," said Printing Expert Dave Polaschek. Check out the article for tips on resolving your printing issues - and much more. Be sure to bookmark John's blog and check back often. As the Senior Product Manager for Photoshop, he is the go-to-guy on all things Photoshop. Also, check out Resolution Video's site for their latest training offerings. Sometimes we find it necessary to convert our images to grayscale. There are a few different methods available to us that yield different results. You've probably heard that simply choosing Grayscale from the Image menu is not the best way to go about it. This produces similar results as converting the image to LAB mode then selecting only the Lightness channel. You may have also worked with the Channel Mixer or CS3's new Black and White adjustment layer tools. I like Calculations for several reasons. I can use it for masking and I can use it for black and white conversions. By using it for black and white conversions, I have an incredible amount of control over the final look of the image. I also have the ability to create a new document from the results, thus preserving my original. Let's take a look. The main reason that I convert to black and white is to facilitate printing on a laser printer. If I know that a detective or attorney will be printing my images in this way, I'd rather tune the images accordingly than leave things up to chance. I want to have good separation and a lot of contrast to my images as many government machines are older and don't have the ability to output a subtle range of tones. Normally, I use this process late in my work flow. I want to get my image corrected and content sharpened first. I will make the conversion right before I interpolate. 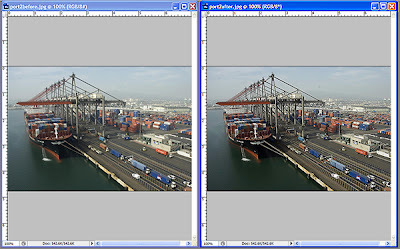 In order to make sure that all of my adjustments are applied before I process this image with calculations, I will want to flatten the image (Layers Palette fly-out menu). Note: Make sure that you save your intermediate version, preserving all of your layers before you flatten and begin with Calculations. For our purposes, we are going to use the image's channel information against itself, as opposed to combining two images. This makes our use of the Calculations dialog box a bit more simple. Bring up your Channels Palette first. Examine the channels to find the two with the greatest amount of colour information and detail. For our border image, we'll use the red and green channels. Now, bring up the Calculations dialog box, Image>Calculations. First look at the Source 1 and Source 2 drop-down menus. They should both display the name of the image that we are working on. Having found your two channels with the most colour and detail, we are going to choose this in the Source 1/2 Channel drop-down menus (red and green). Then we're going to blend these two channels using Photoshop's standard Blending Modes (just like you'd blend two layers together Multiply makes them blend darker, Screen makes them lighter, etc.). For our conversion, Overlay or Soft Light will give us the most contrast. Soft Light works best for this image as it gives us the contrast that we need, but isn't as harsh as Overlay. Finally, choose New Document as the result. 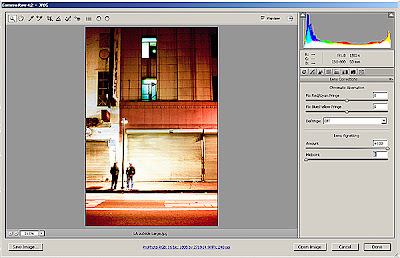 This will create a new document from the combination of the Soft Light blended channels. The new image will show up as an Alpha channel in Multichannel mode. Not to worry. Alpha channels store selections as grayscale images, which is what we want. Multichannel mode images contain 256 levels of gray in each channel and are useful for specialized printing, in our case ... the single Alpha channel. 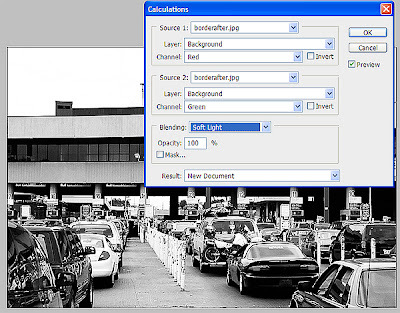 Now simply convert the image to grayscale, Image>Mode>Grayscale. Now, I'll interpolate and add a final touch of sharpening. Then, my image will be ready for the laser printer. The Port of Los Angeles / Long Beach is the largest and busiest port in the U.S., handling about 45% of all containers incoming into Customs and Border Protection. 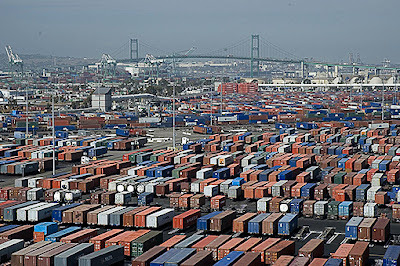 The Port area is also known for being socked in with haze, both from water vapor and from smog. Getting good images of this area can be tough. For our purposes, smog and vapor act like a simple colour cast. This cast can be removed with a Curves adjustment layer quite easily. Notice also, that the haze contributes to an overall softness within the image. In our first photo, there is an overall grey cast to the sky and the foreground is out of focus. We can begin to address these problems systematically within our work flow. The result is a clearer picture, one with a bit more snap. It is often helpful to view the before and after images side-by-side. In this way, you can see if all of the images problems have been solved. You can use Arrange to help. 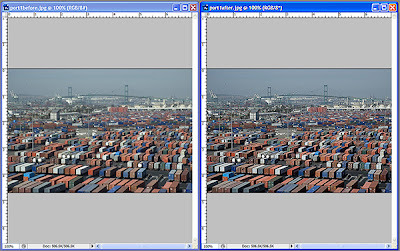 Window>Arrange>Tile Vertically or Tile Horizontally (depending on the image's dimensions). Protecting our borders and ports is a tough job. With a little help from your Forensic Photoshop work flow, things can get a little easier. Soft, with a bit of haze. The colours are back and the image is much sharper. Later this week, we'll take an in-depth look at Curves. Always back up your files. Why, you ask. Hopefully, the answer is obvious. On Saturday, my HP's hard drive crashed. Thankfully, I have a back-up. That's the good news. The bad news is that it looks like the hard drive needs to be replaced (... or not ....). "Not to worry," I said to myself. It's my business machine and I've taken the extra step to purchase a Care Pack. I thought the language on the web site and on the certificate was quite clear. I spent almost a third of the price of the machine for this 3 year service. The description seems unequivocal: if something happens they will come and get it, repair/replace it, and get it back to me within 3 days. My problem happened on a weekend, so I had to wait until this morning to call (standard business day). Then the real problems began. Call begins on 12/17/2007 at 08:05 PST. Automated voice prompts now take the place of the old "press 3 for ..." So, after a minute or so of prompts, I get to a human voice. It turns out that the automated service incorrectly routed my call. No worries, I'll connect you. On hold ... A few minutes later, and I get an English proficient male technician. He works down his check list and then offers to ship a hard drive to me. I mention that I have paid for depot service (see above). He disagrees. We talk about it some more. I want the machine looked at by them, rather than have them send me an endless supply of spare parts (taking the process into weeks and months). That's why I paid the premium for depot service. He "can't help me" because A) my machine was not supposed to be sold in the US (Canadian serial number) and B) they have different info about my Care Pack. I escalate the call to his supervisor. The Supervisor goes through his "angry caller mitigation check list." My computer still is not in route to the depot. It's now 09:35 and I've got to go. Besides, my old cordless' battery is almost dead. I'm on hold ... then get disconnected. I call back, get routed to the wrong group, get put on hold whilst transferring ... and this is taking way too long. I've got to go. I get on the road and call from my cell phone (risky ... dropped calls). I reach a limited English proficient technician. I give her my ticket number. She proceeds to tell me that it will take 2 days to ship me a box. After that, I should see my machine back in up to 2 weeks. I try to explain the care pack again. When this doesn't work, I ask for the supervisor. 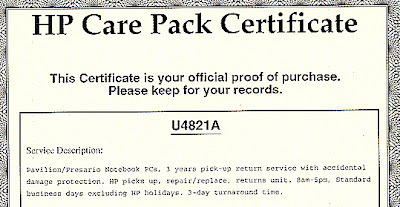 I manage to get an e-mail address to send the scan of the certificate to HP. I get a generic pop address, so I have no way of knowing if this will ever get anywhere. I get placed on hold for another 20 minutes. I get disconnected (probably as a courtesy). It's 10:10 and I'm back on the phone again. I manage to get another limited English proficient (and hard of hearing) technician. He offers to send me a hard drive. I reluctantly accept. He wants my credit card info; just in case I decide to keep the broken part. No problem. Two and a half hours later, I have a order confirmation for a spare part. I didn't feel like hiring an attorney to argue my case on the depot service any further. I started my journey into Windows (from Mac) on a DEC box. DEC was purchased by Compaq and I bought a series of Compaq workstations and servers. The DEC and Compaq machines worked well. HP bought Compaq. I've had two desktops and a laptop (all bought around the same time). I have had nothing but trouble with HP, their parts, and their service (note to HP: when a customer orders and pays for a 80GB hard drive, sending a 20GB drive is not considered a courtesy). This was just the latest episode. I am now running on my back-up computer. It's slow but at least it's working. I am switching back to Mac. I understand that Windows runs faster on an Intel based Mac. I plan on finding out. An update: HP shipped the replacement hard drive to the wrong address entirely (they chose to ship the drive to an old billing address that they had on file - why?) and shipped the software discs that are supposed to come with the drive separately - misspelling my street name badly and omitting the suite number. What is wrong with this company? The discs came to the office and the drive was shipped to my house. In the end, everything arrived. That's the good news. The bad news is that they shipped the wrong sort of drive. The old drive, a Seagate, did not have a metal shroud over the top. The replacement drive, a Toshiba, does have a metal shroud. It plugs into the empty space, but the case cover won't close. Another call to tech support. Whilst on hold, I power on the unit and run the hard drive test. I want to see if the laptop will fail as before with the new drive installed. The test should take 45 minutes to perform. Calls routing, transferring, and hold times as usual, I get an agent. We reinvent the customer service wheel and I proceed to give him all of the information that has been given over and over ... ad nauseum. In this time, the unit powers off as before. I let the agent know and we begin to arrange for depot service. But wait. In the middle of our conversation, his system begins to update. He can do nothing to help me. He takes my number and assures me that this process usually takes an hour. He'll call me back. An hour later, he calls to say that the system is still updating. 45 minutes after that, he calls again. He needs to ship a box to me, but by this time of the day, HP's Fedex pick-up has already occurred. The box won't ship today. I've lost another day. I still don't have the box to return my unit to the depot for repair. I've received all sorts of apologies from call center employees. None of this changes the fact that a week has gone by and they don't even have my laptop to repair. The order status page does not list the box as being sent or give a tracking number. A call to the service center and I get the tracking number. They shipped it a day late, and late in the day so it didn't make it in for next day service. More time lost. What on earth is wrong with HP? I've received a few comments on this topic as well as the post I left on Maximum PC's Dog Pound forum. Many folks have had the same issues with HP. Comforting, but what does it say about this company? Have they completely lost touch with their customer base? On behalf of Hewlett-Packard we apologize for the difficulties you are experiencing. Your message has been forwarded to our Customer Escalation team who will review your case. Just a few minutes later, I received another automated e-mail from the customer service center. My laptop had arrived at the service centre. With them taking a two day Christmas holiday and with them taking two days to deliver the shipping box, it's been 10 days now since my first call. Ten days and they've just received the dead laptop. I click on the link to check the order status page and find that they expect that I will receive my laptop back on the 4th of January. A full three weeks (I'll grant them Christmas and New Year, but most businesses remain open on the eves - HP doesn't) to get my laptop after paying a premium for 3 day depot service? How can a company provide such dismal service and remain in business? I wonder what the escalation team will have to say, if they can work up the nerve to call. Will they offer apologies? Will they offer my money back on the depot service vs. standard 3 year warranty? We'll see. Stay tuned. My heart goes out to the folks buried under the snow and ice. 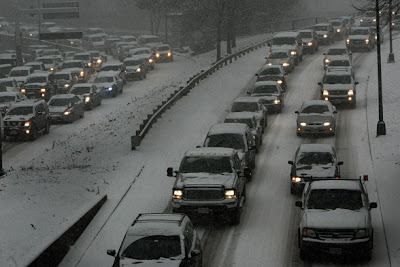 I've lived in Kansas and in Germany where snow and ice can be troublesome to say the least. I hope that you are adequately prepared for the storms and that everything works out ... that you and yours remain safe and healthy. With the current weather patterns in mind, snow and ice can present problems for our images. Notice the above image from the Boston Globe. You can fix the problems with this image in Bridge fairly easily or in Photoshop with a simple Curves adjustment layer. Once you've finished, you really get a feeling for the volume of snow falling to the ground. So if you are stuck at home, why not warm up with a bit of Mother's Milk and a good book. Biker: "You're Hells Angels, then? What chapter are you from?" Medical images can be challenging to work with ... until now. Photoshop CS3 Extended offers a ton of functionality for the medical community. Let's look again at measurements, this time from a mediacal standpoint. First off, activate your Measurement Log palette by clicking on Window>Measurement Log. Next, select the Ruler Tool (I) from the Tool Palette. If you are having trouble finding it, it's in the same group as the Eyedropper. Next, I want to define the ruler's scale by matching it to the image's scale indicator. To do this, I click on the Measurement Log's flyout menu and click Set Measurement Scale>Custom. If you haven't activated the Ruler Tool, it becomes active while this dialog box is open. Now, drag the ruler across the scale indicator in the image. The Pixel Length is automatically filled in as you do this. Then, enter the declared value from the image in the Logical Length field followed by the Logical Units. In our case, 565 pixels = 20µm. 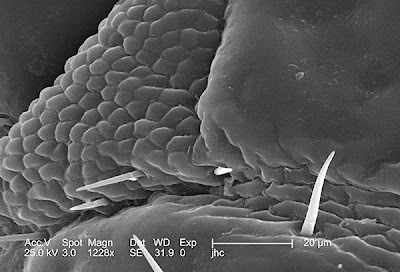 By way of illustrating this further, the giant hair in the foreground measures out at 22.063µm. Once you've taken your first measurement by clicking and holding the left mouse button at the starting point, then releasing at the ending point - click on the Record Measurements button in the Measurement Log. When you are finished with your measurements, click on the Export Selected Measurements button (near the trash can) to export your measurements as a text file. When you are done, go ahead and clean up the image. Medical images tend to be a bit flat. Here is our image cleaned up a bit using the work flow. Pediculus humanus var. corporis never looked so good. 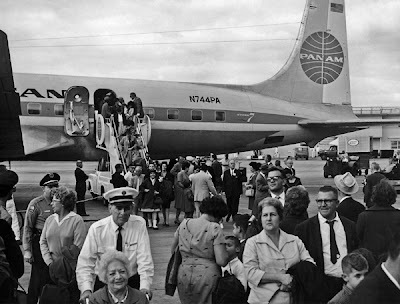 This photograph shows numerous Cuban citizens arriving in Miami, Florida after being airlifted from Cuba in 1965. 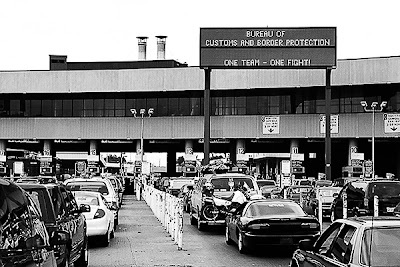 The U.S. Public Health Service oversaw all immunizations of these individuals upon their arrival into the United States. In October, 1965, the Cuban government allowed citizens who opposed the new leadership to leave their country, and emigrate to the United States through the Port of Camarioca, Cuba. Boats began leaving this port in large numbers, but by November 4, many became stranded when the Cuban Government announced that no further departure of Cuban citizens from Camarioca was permitted. 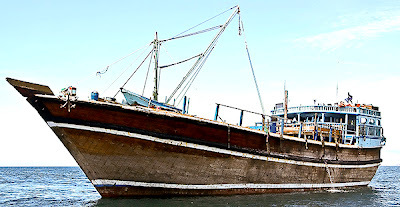 On November 13th, the U.S. Government began a sealift evacuation of the 2,000 stranded refugees at Camarioca using chartered vessels. The sealift was completed on November 24, when the last eligible Camarioca refugees were brought to the United States. 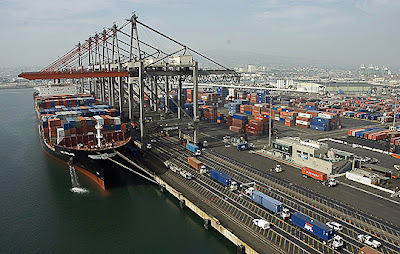 The shift from sealift to airlift took place on December 1, 1965. 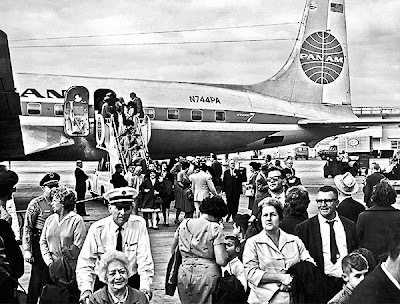 The airlift operated on the basis of two flights per day, 5 days a week, carrying an average of 4,000 persons to Miami, Florida. In all, 9,268 refugees arrived from Cuba during 1965. Of these, 3,349 arrived in December via the airlift arranged by the United States and Cuban Governments. Image from the Public Health Archives. So, you've been tasked with converting old negatives and adding the images to your agency's archives. Notice the image above. It's a bit flat and very soft. It can definitely use a touch of the Forensic Photoshop work flow. With the goal of digitally preserving the image in its best form, we can start by connecting to our scanner. I don't want to do anything much with the capture utility other than to make sure that the image comes in at the maximum limit of my optical resolution (turn off all noise reduction/sharpening in the capture utility ... as well as any auto image control functions). With the push of the button, the image ends up in Photoshop (or Bridge - a topic for a later posting). From here, the work flow is the same. You see from the image above that its flat and soft. We'll start with a touch of focus (either Smart Sharpen 100/50/1 or Optipix Refocus). We can use a temporary Threshold adjustment layer to find our white/black points. When we've found them, we can throw away the adjustment layer. Curves is the best bet for dialing in the lighting and opening up the contrast in this image. Getting the whites just right blows out the sky, so we'll mask that (paint with black). We can address the creative sharpening by building an edge mask, or we can use EasyMask and save a ton of time (see the "must have" links). There is some noise in the image (though not much). The Reduce Noise filter or Noise Ninja will help here, though you will barely notice the difference. We didn't fuzz out the image at all, so we'll move to the interpolation stage. Here, we're presented with either sizing the image up or down ... or leaving it alone. Remember to choose the correct interpolation method. Downsampling the image for this blog softened it up a bit, so I used a Overlay self-blend and a High Pass filter to sharpen things back up. If you have a lot of images from the same source and shot under the same conditions, much of this work flow can be automated to speed things up. If you have someone in your agency who is tasked with archiving old images, recommend this work flow to them. Together, we can help preserve our past in the best light possible. Here is another great site, Photoshop for Video. The site is home to Richard Harrington - noted Photoshop guru. Check out the resources page for some outstanding free stuff. The Free Images page gives you links to a lot of government sites, like the US Army Corps of Engineers Digital Visual Library. I have used images from these sites in numerous in-house presentations. You can find Richard's book, Understanding Adobe Photoshop: Digital Imaging Concepts and Techniques, in my "must haves" links or by clicking here. One of the hardest things to do in our profession is to make the complex understandable. Sure, we perform miracles back in the lab. But, we have to explain those miracles on the stand ... as well as endure the cross-examination to follow. I have watched and learned from some amazing expert witnesses. The most successful experts are the ones that can break down their work to its simplest elements and put it into terms that the jury and judge can understand. I come from a story telling culture, so I've got a bit of a head start. But what do you do, or where do you turn to find your inner story teller. I came across a book on this subject recently and I want to recommend it to you. The book, Whoever Tells the Best Story Wins: How to Use Your Own Stories to Communicate with Power and Impact by Annette Simmons, breaks down the art of story telling into an easy to understand and duplicate formula. I looked at this from the standpoint of a forensic analyst and said first ... can I duplicate this? The answer was a resounding YES! whomever told the best and most convincing story won. Our modern courtrooms are no different. This book is here to help. "Can I duplicate/repeat this" is the hallmark of our profession. With this guide book, you certainly can. If you are looking to improve your testimony, if you are looking to add some power and impact to your courtroom communications ... this book is most definitely for you. At less than $15, its less than our daily trips to Starbucks. You can find it on Amazon.com or by clicking here. Artists and photographers purposefully use vignetting for various reasons related to their final composition. Vignetting is a reduction of brightness or saturation at the periphery of the image (especially the corners) as compared to the center. When artists and photographers do it, it's a purposeful choice used to further their vision. When a CCTV camera does it, it's a defect. Until recently, the fix for this involved masking and a lot of time and effort. 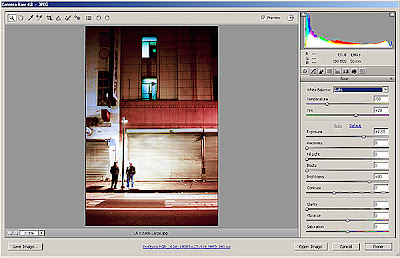 Now, we have the ability to work on a majority of our images in Adobe Camera Raw. Built in to ACR is a feature to compensate for this defect. Increase the Amount slider to lighten the corners, or decrease the Amount slider to darken them. Decrease the Midpoint slider to apply the adjustment to a larger area away from the corners, or increase the Midpoint slider to restrict the adjustment to an area closer to the corners. It's really that simple. 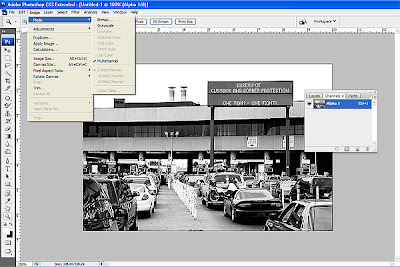 The preview pane let's you see the results before you take the image into Photoshop for further correction. Because you are working in ACR, the effect is applied non-destructively. You can always clear the settings in Bridge (unless you've saved the image) by right-clicking on the image and choosing Develop Settings>Clear Settings. I am sure that this little time-saver will become a welcome addition to your Forensic Photoshop work flow. You won't need it every time, but it will definitely save you time and effort when you do. For those that are familiar with this blog, you'll remember that I separate Forensics from Forensic Science. Forensics, from the Latin root "forensis," meaning forum and Forensic Science meaning the application of a broad spectrum of tools and techniques to answer questions about a particular piece of evidence in the legal system. Have we sleep-walked our way into a surveillance society? Surely if you’ve got nothing to hide, you’ve got nothing to fear? So is CCTV less like Big Brother and more like a benevolent father? A big part of using Photoshop for Forensic work is being able to explain your results in court. Whilst on the stand and under cross examination, you may get questions like the ones above. "I call your attention to People's 34A. I find that this image is grainy and unclear. What is clear is that this does not show my client - the one sitting over there. Don't you agree? With this in mind, is CCTV effective as evidence? Clearly, I would say no ..." It's up to your side's attorney to object when appropriate to do so, but you may have to answer questions such as these. You are an expert and the courts will want to hear your opinion. That is why you are there. How do you prepare? Check out the Institute for Ideas' page on their CCTV debate. See how the arguments are structured. See the questions and responses. Look at the articles that they cite. Examine the data that they refer to. What conclusions can you draw? Is there a particular style involved when making an argument? Do you buy their premise? Are their facts correct (one side says 4.5m-5m cameras in the UK and the other rules out private unmanned CCTV and comes to a total of around 1.5m)? There will be a time when you are on the stand and the attorney will attempt to frame a question to suit his/her client's best interest ... and it may not fit the facts. Do you accept the premise of the question and proceed to answer from a position of weakness? Do you challenge the premise? Do you ask him/her to restate the question in simpler terms? Notice on the debate's page that there are arguments both for and against. What do you do? Challenging the premise could make you appear to be a bit cocky whereas having the question restated could make you seem as though you aren't an expert. Preparation is the key. Preparation starts with information; info like the links on this page. I want you to be as prepared as possible to engage in courtroom forensics as you are to engage in the forensic science for which you are employed (or wish to be employed). Of course it can be done. I am sure that, with adequate preparation and a dash of confidence, you can do it too. This morning, I want to call your attention to the CCTV User Group. Located in the United Kingdom, the group has members around the globe and serves as an outstanding resource for information on public and private use of CCTV systems. You can find out more information by clicking here. 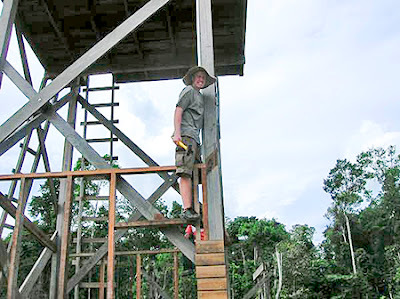 Find out about the groups efforts outside the UK by clicking here. One of the many benefits of membership is their magazine, CCTV Image. 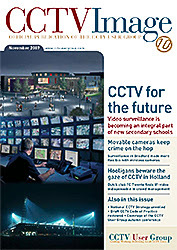 The November 2007 edition has features on School Security, Redeployable CCTV, as well as a response to draft CCTV Code of Practice. Past editions have dealt with highway CCTV, large event CCTV, public housing CCTV, as well as Video Analytics, and lens selection tips. Of particular note in the latest edition is a link given in the CCTV User Group's Director's column to The Home Office ACPO National Strategy for CCTV. There is also a detailed discussion on the Strategy on page 8. "While developments in technology have outpaced some of the capabilities within the police and justice system, the new National CCTV strategy aspires to meet the challenges so the benefits and full potential of CCTV can be maximised," reads the commentary. It goes on to say that "the report acknowledges the significant role that CCTV has played in protecting the public and assisting the police, as well as the leading role that the UK has held in the development of CCTV worldwide." The UK's Home Office has produced some outstanding documents over the years. Those that are crafting best practice documents or SOPs for their agency should consult the HOSDB's on-line publications related to this complex field. The why of this topic is best put this way: “You can create as many images as you want, but unless that person gets nailed in court there’s no point in creating the image! You’re the start of the journey to getting crimes into court and helping make our communities safer.” - DCI Mick Neville, Metropolitan Police (In CCTV Image, November 2007, pg. 22) I couldn't have said it better myself. Visit the links and check this valuable resources out for yourself. Better yet, encourage your agency to fund your membership in the group. Groups like this deserve our support. Rules of engagement for using Photoshop?